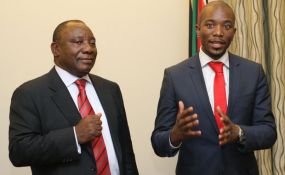 President Cyril Ramaphosa and Democratic Alliance's Mmusi Maimane (file photo). The DA says its lawyers are considering laying charges against President Cyril Ramaphosa following reports that he had prior knowledge of widespread looting at VBS Mutual Bank but allegedly failed to act. Mmusi Maimane said in a statement on Sunday that the charges would be in accordance with the Prevention of Organised Crime Act (POCA). City Press reported that Ramaphosa was apparently informed of widespread corruption and looting involving bank executives at a meeting in Johannesburg very early last year. Sources close to a major VBS shareholder said the shareholder personally informed Ramaphosa, who was not president at the time, about what was going on, according to City Press. Ramaphosa promised to do something about it, but he did not, according to the City Press' source. Ramaphosa's spokesperson Khusela Diko reportedly told the publication that the Presidency had no knowledge of such a meeting. Diko's phone rang unanswered on Sunday and she did not reply to an SMS News24 sent to her. Maimane said these were "incredibly serious allegations" that needed to be answered by Ramaphosa with "haste". "I will therefore be submitting an urgent question to be asked during oral questions to President Ramaphosa in Parliament on Thursday to confirm the veracity of these allegations," Maimane said in a statement. "While President Ramaphosa's spokesperson, Khusela Diko, has denied this meeting ever occurred, the President would be wise to use his final oral questions session for the year next week to play open cards with the people of South Africa," said Maimane. Advocate Terry Motau SC released his damning report, The Great Bank Heist , on Wednesday into how 50 individuals and companies, including many of the bank's executives, received "gratuitous payments" amounting to R1.8bn from the bank. It has also been alleged that former president Jacob Zuma's VBS loan of R8.5m - used to pay back part of his Nkandla home upgrades - was used as political security. "South Africa cannot afford another compromised president," Maimane said. He said the allegations were all symptomatic of the loss of power in the ANC and was demonstrable of the politics of patronage trumping the service of citizens. "The absence of divisive action and the protection of certain individuals can only mean that unity in the ANC is more important than accountability to the ruling party. And it begs the question of what other scandals the president also had knowledge of. This system of corruption must be broken," he said. Maimane suggested that Ramaphosa's "'New Dawn' glass box seems to have shattered". "He has already confirmed his willingness to appear before the State Capture Commission and now needs to start picking up the shards of this ANC-created mess and come clean with South Africa," Maimane said.